I don't feel like it should already be time to start thinking about Christmas. Our weather has been so nice and I still have tomatoes in my garden, I think that is a record for us. October through December is my favorite time of year. I love watching the leaves fall, cool evenings, cold nights, the first snow falls, & Christmas. I love giving gifts and planning holiday parties. 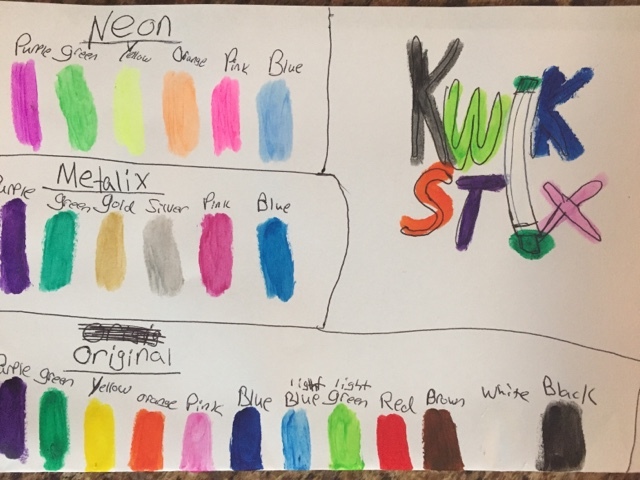 One thing that is on my gift giving list this year is Alaina's favorite art supply, The Kwik Stix Solid Tempera Paint Sticks from The Pencil Grip, INC. The Kwik Stix, available at Target stores and Target.com, are solid tempera paint sticks that dry in 90 seconds. They are AP certified, meaning they are non-toxic and safe for young children. They work on paper, wood, canvas, cardboard, and many other crafting mediums. 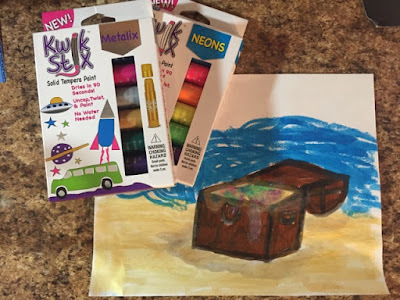 Alaina received her first box of 12 colors not too long ago and she now has the brand new Kwik Stix Solid Tempera Paint Neons 6 pack and the Kwik Stix Solid Tempera Paint Metalix 6 pack. She loves them!! She loves having so many colors to choose from and she can paint any where without having to get out brushes & water. Alaina wanted to see all of the different colors in one place, so she made herself a color chart. She keeps this chart in her drawer with all of her Kwik Stix. Alaina loves to make birthday cards. As soon as she received the Metalix Kwik Stix she had an idea for a birthday card for her uncle. She made him a toolbox and inside she added a drill, hammer, screwdriver, and screws. She drew all of her pieces, painted them with her tempera sticks, and cut them out. She was so excited that she could get the silver parts to look like metal with her metallic paint sticks. Our pictures make them look gray, but looking at them they look metallic. She wrote her birthday greeting and we signed the back of the drill. All of her pieces fit inside her toolbox. Another card she is working on she used the Kwik Stix Neons. 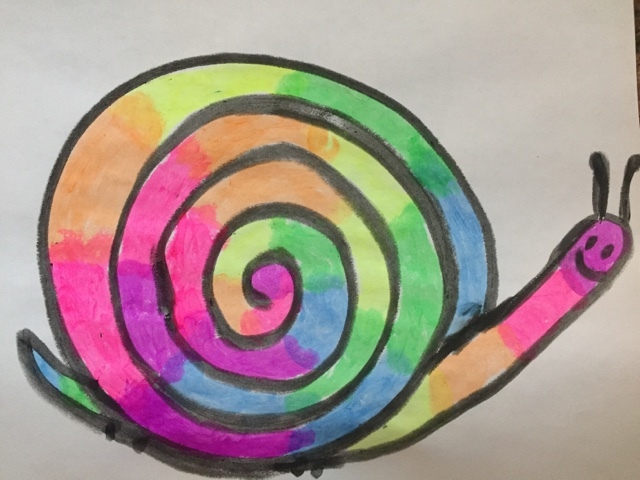 She decided she wanted to use all of the colors, so she made a neon rainbow snail. She hasn't finished the inside of the card & I don't even know who she wants to send it too. If you are the lucky one to get it you'll know it was painted with the tempera paint sticks. 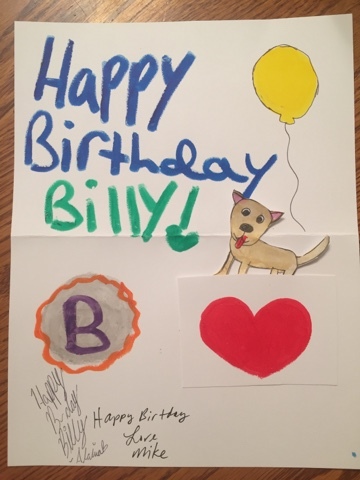 For her other uncle's birthday she made him a little dog that pulls out of a heart pocket. She used a variety of her Kwik Stix for this card. The Kwik Stix Solid Tempera Paint sticks will make a perfect gift for any child. My artistic kid loves them because there is no mess involved, my non-artistic kid loves them because she can paint hassle free when I make her. They are on my list for gift giving this holiday season and they would make a great addition to yours. November 1st, 2016 is the first day Kwik Stix 6 packs of Basic and Metalix colors will be available in Target stores. That will make it so easy to pick up a few for gifts & stocking stuffers. If they sell out too fast don't forget to try Target.com. The Pencil Grip, Inc has been generous enough to allow me to host a giveaway just for you. I have a set of Kwik Stix Neons 6 pack and Kwik Stix Metalix 6 pack to giveaway. Just enter the Rafflecopter below. Disclaimer: I received Kwik Stix Neons 6 pack and Kwik Stix Metalix 6 pack free of charge from The Pencil Grip, Inc. in order to write my review and offer a giveaway. No other compensation was received and all opinions are my own. Canvas! Thanks for the chance. i would paint on a t shirt first. we would have a blast with this. I'm going to these to my grandson for Christmas. He loves to color and paint. I will give these to my son for Christmas. He loves to draw. 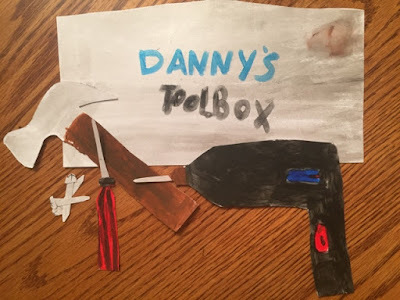 My children are so crafty that they would love to put this to good use with a fun project. I would give them to my 5 year old daughter who would use paper. I think these would make an awesome stocking stuffer for my daughter who is the true artist of the family. I'm not sure what she would use, probably construction paper. These would be a gift to my crafty daughter for Christmas. My daughter would love to paint a canvas for her room. I would give this to my 4 grandchildren as they are homeschooled and could use it. I would use as a gift but probably on clothes. Probably regular paper or a small canvas. I would give this to my daughter for Christmas. She would use construction paper to try them out first. I would use them for scrapbooking. I would definitely have my oldest daughter paint on canvas first with these! :) She is an amazing artist for her age so I would love to see what she would create, and then hang it on our wall! My little one would want to color on everything with this... but it'd be fun to add more sparkle to our paper flower headbands! I will be using my paint sticks as a gift to someone who I know will LOVE them! I would use it on posterboard. I like to make cards. I'd use these for those projects! I would gift to my daughter, she loves driving. I would give the paint stix as a gift to my granddaughter for Christmas. The paints would be a fabulous gift! The paint stick will be giving as a give to my grandchildren. I'll give these as a gift to my niece and nephew. They look like fun! kristiedonelson(at)gmail(dot)com Thank you. i would give this to my nephew for christmas! My kids are the crafters, anything that they are told they can use these on they will. they'd love to make tons of gifts with these! As a gift to my grandchildren because they so love to paint and draw and I want encourage that like any grandmother would do. I have stacks of tiny canvas to use up. These would be perfect. This would be a gift for my nephew! Thanks so much for the chance! Would use on a posterboard project. I will give this to my granddaughter to use for her art projects. We would probably draw some autumn pictures first. I would have them available for my grandkids to use. I'd like to make ornaments with them. I would love to use these to create some new holiday decorations or maybe just to add to the ones I already have by sprucing them up! I would gift them to my nieces. think these will be a gift! Oh we would love to use these on paper at our table! Our little one loves to paint, but its always so messy. These are sooo neat! My daughter would love to use these on her easel. I would definitely give these to my daughter. She loves crafting and would absolutely love these. I would give as a gift to my niece. She is an avid crafter and would get lots of use out of these. I would paint on wood for some art projects and decorations. I'd probably use them first on coloring books. Thanks for the giveaway! I would use them as a gift. Our grandson would enjoy playing with these. I think I would let my kids paint Christmas pictures ob canvas with the paints.